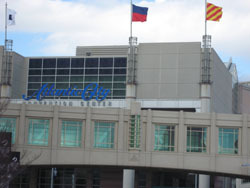 The Atlantic City Convention Center opened in 1997. It replaced what is sometimes called "The Historic Atlantic City Convention Hall," which had been in operation since 1929. The Convention Center is located at Convention Boulevard, at the last exit of the Atlantic City Expressway. It is a completely new and modern structure that opened in 1997. It has 500,000 sq. ft. of contiguous floor space, 45 meeting rooms, 5 exhibit halls, and indoor parking for 1,400 vehicles. One of the largest solar panel roofs in the nation is installed at the convention center. It also has one of the most extensive WiFi networks on the East Coast. 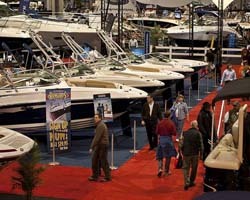 A few examples of annual events held at the convention center are shown below. Historic Atlantic City Convention Hall which has been renovated and renamed Boardwalk Hall. Use the map below to locate the Atlantic City Casinos.